Today�s release of documents obtained from whistleblower Edward Snowden is by far the most explosive and most damning of any of the material that Mr. Snowden began to release in June of this year. They reveal the truly outrageous and criminal character of the Pentagon�s spying operations against civilians. And they make it clear, as Congress gets ready to debate the surveillance programs, that any Congressional representative or senator who refuses to take action to end these programs is violating their oath of office to uphold the Constitution. The new documents show that �the government is tracking people from afar into confidential business meetings or personal visits to medical facilities, hotel rooms, private homes and other traditionally protected spaces� by the NSA gathering nearly 5 billion records a day on the whereabouts of cell phones users locations, according to the Washington Post article authored by Barton Gellman and Ashkan Soltani. Gellman was one of the reporters to whom Ed Snowden released NSA documents. 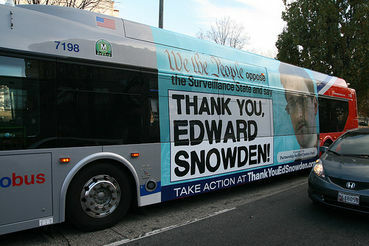 This bus, bearing "Thank You Ed Snowden" ads, is currently going through the streets of Washington, D.C. The Pentagon (the NSA is an agency of the Pentagon) monitors and records the location data every day of hundreds of millions of cell phone users � inside the United States and around the world -- enabling it to track the movements of every person and map all of their relationships and activities. It takes 5 billion phone records per day and feeds them into a vast database and uses the most sophisticated tools to analyze and instantly profile every individual�s activities, communications and relationships. Thank you for supporting us on this issue. Senator Robert 'Bob' P. Casey Jr. Noted and signed, thanks JL. It occurs to me these children have become addicted to their silly game of seeing who can invade our privacy the best. This has little to do with protecting us from terrorists - a hollow threat at best for the vast majority of us. They would have us live out lives in fear so they can continue to invade our private lives. These children need to have their toys taken away from them. Thank you for supporting us on this issue. Please consider inviting your friends to support us. Signed. Thanks. The NSA is an equal opportunity snoop on everyone. WOULD SOO LOVE to sign this one, cannot- and today our news said on this particular issue(re cellphones) they(NSA) are monitoring ONLY FOREIGNERS , NO US CITIZENS. At least I had an opportunity to sign the "Thank you Edward Snowden!We say no to the surveillance state!" campaign! Thank you, Angelika Roll, for supporting the 'Thank You, Edward Snowden' campaign! PLEASE EVERY ONE SIGN THAT ALSO !! too bad this site will not come up on my older computer and browser - why would a site that wants to communicate to all people use fancy do-dads that eliminate those who can not keep upgrading???? i try to get the message to them but on this website i couldn,t even get that far! too bad! unless you've already signed earlier- but that link is easy to overlook, I admit. Messages gladly sent. Noted. Thank you, JL. I feel very strongly about this, and probably sent those messages twice. Thank you to Angelika for the hotlink thanking Ed Snowden...I think I missed signing this before, and was very glad to sign now. Thanks JL for the post. Message signed and noted. Thank you Mr. Snowden (signed that one also)! Noted, signed, emailed & tweeted Thanks. Michael Kirkby, the petition doesn't recognize Canada, but I bet that the NSA still spies on us. Certainly the CIA was spying on us when Qu�bec elected its first separatist government in 1976. Most countries have a habit of spying extensively on everyone and everything. Since the powers that be are so interested in snooping, the least they could do is send us some free refrigerator magnets as compensation for being involuntary subjects (suspects). Course, those would probably be itty bitty spy devices activated upon the opening of the refridgerator door. No one would be left behind. Comforting to know, isn't it? for supporting the 'Thank You, Edward Snowden' campaign! Could not sign, not us. My idea is, this is a sure way for them to put all signers on their watch list, maybe even reading such "dangerous" texts is enough. I do declare herewith - F*** them.